COLECTIVO CIRYAS: CUARTA SESIÓN DEL TALLER DE FORMACION POLITICA, CLAUSURA INVIERNO 2008. C.I.R.Y.A.S. 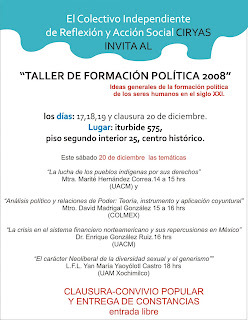 CUARTA SESIÓN DEL TALLER DE FORMACION POLITICA, CLAUSURA INVIERNO 2008. C.I.R.Y.A.S.